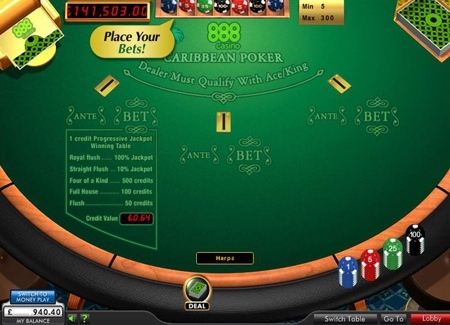 Caribbean Poker is a Poker-style game, in which the player competes, one on one, against the dealer with hands formed from 5 cards. 888Casino's Caribbean Poker is played with a standard 52-card deck. To start the game, the player must place an "Ante Bet". The dealer then gives each player 5 cards face-up. The dealer also receives 5 cards; four cards dealt face down, and one card face up. When the player looks at his/her cards, and the dealer's Up Card, the player either challenges the dealer's hand, by placing a bet, or surrenders. The "Challenge Bet" is always equal to twice the Ante Bet. If the player chooses to "Surrender", the Ante Bet is lost. When a Challenge Bet is made, the dealer reveals his 4 remaining cards, and the hands are then compared. In order to qualify, the dealer's hand must contain at least an Ace and a King or better. If the dealer's hand does not qualify, the players receive a 1 to 1 payout on their Ante Bet, and the Challenge Bet is returned without winnings. Should the dealer's hand qualify, the player's and dealer's hands are then compared, and the best hand wins. A player's winning hand receives 1 to 1 on the Ante Bet, plus the winnings on the Challenge Bet. If the hands are equal, it is considered a "Push", and both the Ante Bet and the Challenge Bet are returned to the player. Caribbean Poker players can place an additional '1 credit' chip bonus bet if they wish to participate in a progressive jackpot side game. By placing this additional bonus bet, you have the chance to win even when the dealer does not qualify! Below are the winnings based on the optional '1 credit' chip bet. To ensure equal bets amongst all currencies, the credit value is calculated based on the daily USD exchange rate. Royal Flush wins the entire Caribbean Poker jackpot. Should you not be lucky enough to scoop the full jackpot, get a Straight Flush and you'll still be walking away with 10% of it, just like most land-based casinos would offer. The best thing is that you Bonus Bet also offers fixed payouts on even lower hands - get paid with a Flush or higher.